GCS offers EOD/Counter‐IED standard and tailored to mission training programs, whether it is a maintainer, operator or train-the-trainer course. GCS will design the training in accordance with exact user requirements and can deliver it at a location of the customer’s choice – worldwide or at our fully equipped training facility in Germany. 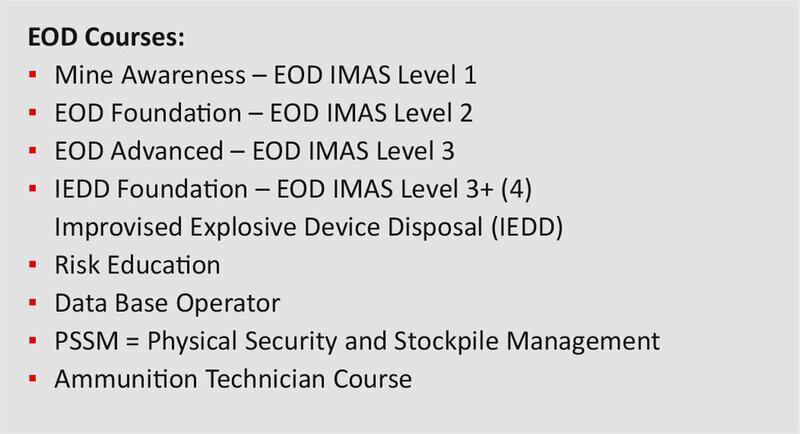 Our training programs cover all aspects of planning and conducting EOD/IEDD operations for military/ law enforcement. Regarding humanitarian mine action (HMA), we endorse the United Nations Mine Action Service (UNMAS) philosophy to train and capacitate civilian personnel and follow IMAS* guidelines. Our Counter‐IED (C‐IED) training programs cover all aspects of planning and conducting C‐IED operations responding to an IED threat.